The smaller flags surrounding this set of firefighter gear each represent an emergency services worker who was killed while helping the survivors of the 9/11 terrorist attacks. Photo by Jennifer Trinkle (Photos from the Soul). 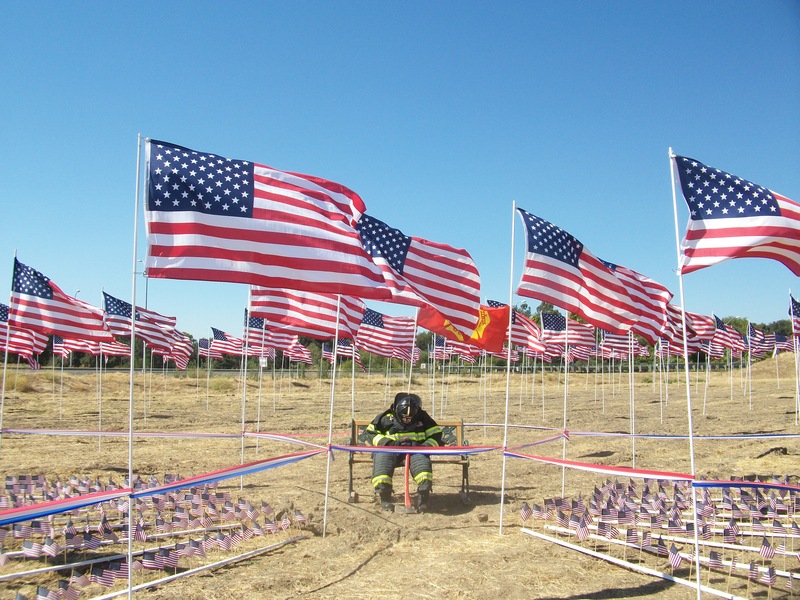 The annual West Sacramento 9/11 memorial, which honors the victims of the 2001 terrorist attacks, by placing flags on display with each representing one person who lost his or her life, is currently on display and will continue to be visible to the public through the anniversary. The memorial, located approximately one mile from the City College West Sacramento Outreach Center in a field on the corner of Jefferson Blvd. and South River Rd., was put together by former West Sacramento resident John Vinson in 2007. In total, the display consists of 2,977 small flags for the victims and 500 large flags, which are used to help make the memorial visible to drivers as they pass the field. Vinson said it took two days to set them all up. On the first day there were 12-14 people helping set up the flags and by the end of the second day, it was down to about three people, Vinson said. There are six displays of flags including one for the World Trade Center victims, one for the emergency responders and one for the police men and women who died either in the attacks or while helping the victims. In addition, Vinson said there is a new display this year, complete with a Massachusetts state flag, which represents the victims of the Boston Marathon bombing. The memorial started on Sept. 7 and will be taken down on the morning of Sept. 12. It is free to view and is available 24 hours a day. “The field has become many things to many people,” said Vinson in a statement. “It is a place of healing, a place of forgiveness, and a place to teach younger generations about the importance of patriotism and solidarity as one united group of Americans. This entry was posted in News, Sac City Express (SCC) and tagged 9/11, Express, John Vinson, memorial, news, Sac City College, Sac City Express (SCC), west sacramento. Bookmark the permalink.